Geek Lit Etc. : Manga Monday: Devil King for Student Council! Manga Monday: Devil King for Student Council! The crowd's all here - from Maou and Emi to Mayumi Kisaki and Lucifer in The Devil is a Part-Timer! High School! Volume 1. Once again, Maou-sama has to find his place in this strange new world, and now there's even more drama than in the backroom of the fast food joint. He is, arguably, in a better position to take over all of Japan, and then the world now. Every great leader needs a great education, you see, and what better place to start than in high school? A high school has plenty of room for our favorite faces. Alicel is working as custodian so that he and Maou get free room and board. Emi and her friend Rika Suzuki transfer in shortly thereafter, and poor Chi-chan was here to begin with. Maou's boss from MgRonalds is now their teacher, and other characters wander in over time. 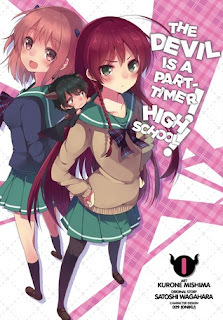 The story roughly follows that of the light novel and manga, with Maou planning to take over the world using Student Council President as just the first stepping-stone. There's a challenge to sell the most curry puddings, and Emi becomes injured on a class field trip. Even though we've heard the song before, the remix still entertains. The whole 'high school' versions of popular manga is becoming more and more common. While it's kind-of fun to see favorite characters in a completely different setting, the whole idea is just a bit bizarre. The gaps in ages are scaled down, so that Chi-chan is the same age as Maou and Emi, which changes the dynamic of their relationship a bit. And figuring out how to wedge in side characters stretches the bounds of credibility. Even so, The Devil is a Part-Timer! High School! Volume 1 is a fun alternate story for big fans of the existing series. Highs: It's cute that even her, Alciel ends up cleaning up after everyone. Lows: How many students can transfer into the same class in just two days? Verdict: Only meant for real fans of the original series, The Devil is a Part-Timer! High School! Volume 1 reads like a high school fantasy of a fanfic - in all the best ways. Labels: fantasy, Kurone Mishima, manga, Satoshi Wagahara, shonen, The Devil is a Part-Timer! High School! How far can a friendly dragon get in the world?